If you have been dreaming of perfect luscious locks on your wedding day, but are unsure of which direction to go, we have you covered! As a hair and makeup team creating bridal looks for over 6 years, we have had our fair share with extensions, and learned what works great for each type of bride. Why do you need hair extensions? Many times brides-to-be that have fine textured shoulder length hair come in with images of long thick locks in hopes that we will recreate this dreamy look. Our answer to them ... hair extensions! Hair extensions can create not only length, but thickness and amazing color dimension. Not to mention they can prevent your style from falling flat on one of the most photographed day of your life! If you already have long, thick, flowing locks *but your color is feeling bland, can create gorgeous multi-tonals looks*! 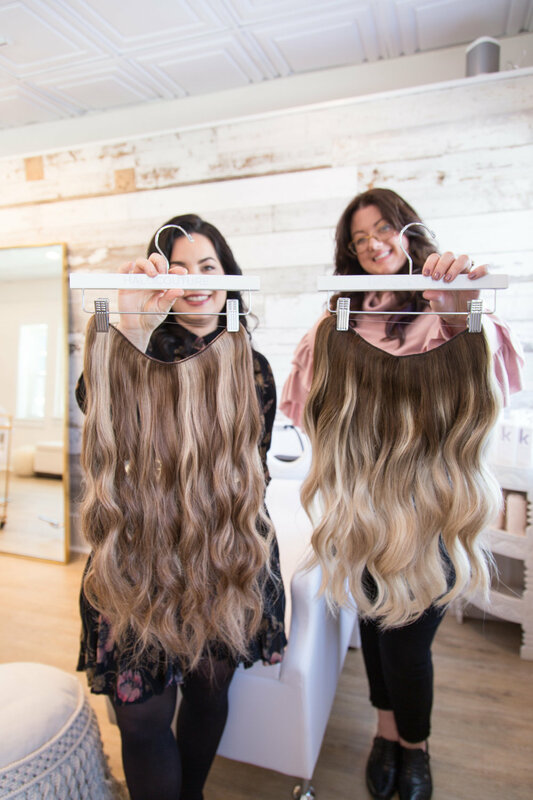 With so many options on the market, we have narrowed it down to three very different types of hair extensions we absolutely love and so will you! So depending on your wants and needs, between these three methods you can have the hair of your dreams! This is an amazing alternative to the traditional clip-in extensions. Halo’s are the latest and greatest in temporary hair addition, are so comfortable, stay on perfect and look AH-mazing! As an added bonus, you can easily reuse them again and again. It takes just minutes to put in or take out, are customized to your head size, and come in many lengths and colors. Plus, we love them! Tape-ins are an excellent choice if you want something to last a little longer than your big day (about six weeks). This option can give you a ton of volume and length that blends in perfectly with simple maintenance. They are quick and easy to apply, and can be reused 2-3 times. The tape-in removal and/or application must be done by a professional. the ultimate in quality and reputation — we’re talking celebrity status. Maintenance is super simple and they are extremely comfortable. It takes 4-8 hours to apply and each extension is one-time use only. 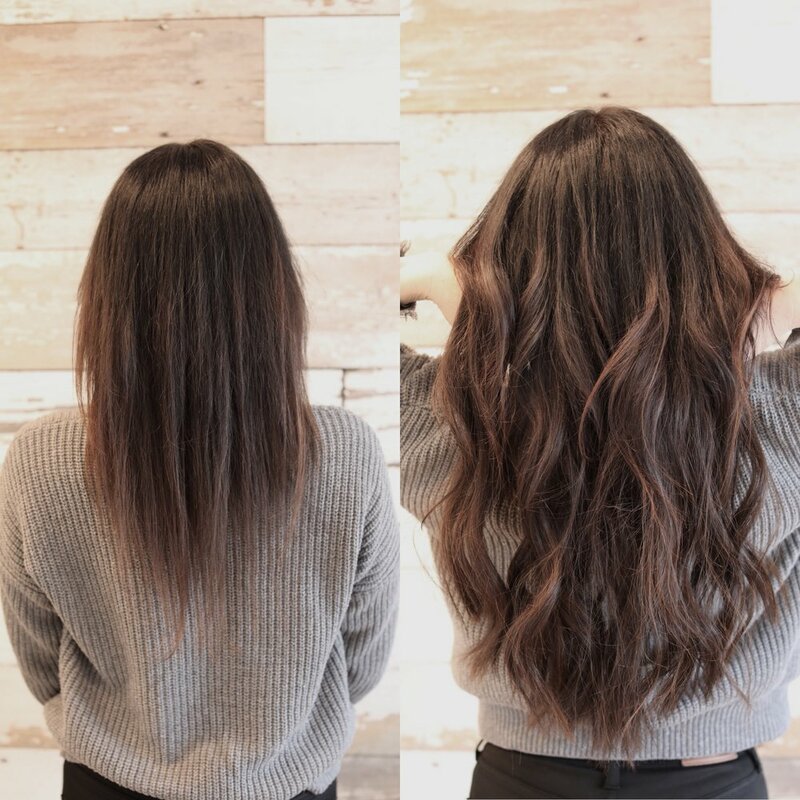 We’re so sure you’ll love these extensions that you’ll want to say “Yup, this is the new me!” Great Lengths require professional removal, which normally takes 2-4 hours. We understand not everyone is a candidate for bonded or tape extensions. If your concerns are hair loss, visible scalp, or other medical concerns the Halo products are perfect. The classic Halo can be beautifully combined with a Fall on top to conceal any areas of concern. Let us help you find the perfect hair extensions for that perfect bridal look you have always dreamed of for your wedding day! Contact one of our hair extension specialists today!